Chronic kidney disease (CKD) in children contributes to the global health burden.,, The disease is defined as “the presence of markers of kidney damage for three months or more with evidence of structural and functional abnormalities of the kidney, with or without decreased glomerular filtration rate (GFR), which is manifested by either pathological abnormalities or other markers of kidney damage, including abnormalities in the blood, urine or in imaging tests; or GFR <60 mL/min/1.73 m2 for three months or more, with or without kidney damage.” Specifically, the Kidney Disease: Improving Global Outcomes (KDIGO) guidelines have defined CKD as abnormalities of kidney structure or function, present for >3 months, with health implications. Although the KDIGO definition has been formulated for the adult population, the current pediatric CKD classification by the National Kidney Foundation, Kidney Disease Outcome and Quality Initiative outlines early stages of the disease as stages 1–3, while stages 4 and 5 constitute the late stages: stage 5 representing end-stage kidney disease (ESKD). In the developing world, the cost of renal replacement therapy (RRT) for ESKD remains prohibitive for the majority of the patients. Unfortunately, the expenditure for renal transplantation and post-transplantation management are unaffordable for most recipients in these low- and middle-income countries. The importance of CKD classification lies in these advantages: its correlation with outcomes such as disease progression, cardiovascular disease risk, and all-cause mortality; and the possibility of therapeutic interventions in earlier stages of the disease to retard its progression and improve quality of life and survival., Adopting proactive measures to identify the earlier stages of disease or predict its progression would obviously help to reduce ESKD-related mortality. Such measures should include the development of tools for diagnostic and prognostic evaluation of CKD. Interestingly, the focus on using novel biomarkers to predict the onset and progression of the disease has increased tremendously over the past decade. Discovery of these biomarkers offers prospects for the early anticipation of the late stages of CKD, slowing down disease progression, and achieving better disease outcomes. This is because they can detect kidney injury before albuminuria, which has served as the conventional biomarker of kidney disease. The aim of this review is to classify and highlight the utility of these novel biomarkers in predicting the onset and progression of CKD. With respect to regional disparities, the pattern of etiologic factors in childhood CKD shows that congenital disorders, including congenital anomalies of the kidney and urinary tract (CAKUT) and hereditary nephropathies, are responsible for about two-thirds of all cases of the disease in developed countries, whereas acquired etiologies predominate in developing countries. For instance, previous reports from the United States, Italy, Belgium, France, and Sweden, confirm that CAKUT is the prevalent etiologic factor. However, in a more recent report from Nigeria, the following primary etiological factors were noted in this order of frequency: glomerular disease-nephrotic syndrome, chronic glomerulonephritis, toxic nephropathy, CAKUT, chronic pyelonephritis, sickle-cell nephropathy, human immunodeficiency virus-associated nephropathy, and diabetic nephropathy. Elsewhere, in the Middle East, a report from Iraq has identified focal and segmental glomerulosclerosis, hereditary polycystic kidney disease and cystinosis, as well as CAKUT as the major causes of CKD in children. On the other hand, when age-specific variations are taken into consideration, reports show that the primary causes of pediatric CKD significantly differ among the pediatric age-groups. For example, although the major etiologic factors are apparently represented by CAKUT, steroid-resistant nephrotic syndrome and chronic glomerulonephritis, it has been observed that structural causes such as renal hypoplasia or posterior urethral valves clearly predominate in the younger age bracket, while chronic glomerulonephritis is prevalent in the age bracket above 12 years., Nevertheless, reductions in the number of nephrons associated with low-birth weight and small-for-gestational-age infants and the rising burden of pediatric obesity are now emerging as important predisposing factors to pediatric CKD.,,, These conditions may in future significantly alter the relative distribution of the causes of CKD in children. Interestingly, several novel biomarkers have recently been reported and documented as predictors of disease onset and outcome in some of the etiologies of CKD such as nephrotic syndrome,,, chronic pyelonephritis, congenital obstructive nephropathy,, and diabetic nephropathy (DN). These diseases are characterized by abnormalities of kidney function and structure; thus, biomarkers of CKD are broadly divided into biomarkers of kidney function and biomarkers of kidney damage. GFR remains the most important marker of kidney function, but it cannot be easily measured in most clinical and research settings. Thus, equations for its estimation are predicated on filtration biomarkers such as serum creatinine and serum cystatin C. Given the poor ability of these biomarkers (serum creatinine and blood urea nitrogen) to detect kidney disease in the early stages, the diagnosis, classification, and staging of CKD using GFR has been recommended by the KDIGO. However, the procedural difficulties associated with measuring the GFR using various exogenous and endogenous markers have limited the applicability of this measurement in clinical settings. Over the years, equations for eGFR have evolved from the Cockcroft Gault equation, modification of diet in renal disease equation,, CKD-Epidemiology collaboration equation (CKD-EPI), and more recently to the equation that combines creatinine and cystatin C. Several studies have compared the accuracy of these equations among adult patients with CKD.,,, Data from these reports show that the CKD-EPI equation are more reliable than the other equations in estimating GFR, resulting in fewer false positive diagnoses of CKD. Furthermore, the CKD-EPI is associated with a more precise risk prediction for outcomes and prognosis. Thus, the KDIGO clinical practice guideline for the evaluation and management of CKD, recommends the diagnosis, classification, and staging of the disease by eGFR and suggests the use of CKD-EPI as the preferred prediction equation. Kidney damage usually precedes changes in renal function as it is a well-known fact that albuminuria precedes any decline in eGFR. Although albuminuria is the traditional biomarker of kidney damage, it may only be present after significant damage has occurred or may be absent in other types of kidney damage such as tubulointerstitial disease and hypertensive kidney disease. For instance, despite the role of microalbuminuria (urine albumin excretion of 30–300 mg/day) as a risk factor for CKD and ESKD in diabetic patients, several biomarkers of glomerular, and tubular dysfunction can precede microalbuminuria.,, Nevertheless, the combination of albuminuria with eGFR has been found to improve the prediction of CKD progression to ESKD. This observation was corroborated by other investigators who were able to establish that combining cystatin C with serum creatinine and albumin-creatinine ratio improved its predictive ability for CKD progression and mortality. Better still, these findings underscore the fact that using each of these markers as a stand-alone biomarker decreases its predictive ability for disease progression. Expectedly, there has been a paradigm shift to novel biomarkers which could identify patients with CKD early enough, to allow for early interventions that would halt disease progression. The utility of these biomarkers have now been well documented, but the more promising ones will be classified and discussed. These consist of tubular biomarkers, as well as miscellaneous biomarkers which are associated with the various renal disorders that constitute or result in CKD in children [Table 1]. Table 1: Novel biomarkers of chronic kidney disease and their predictive value. First is the transmembrane protein called kidney injury molecule 1 (KIM-1), which is highly expressed in renal tubules. It is an early biomarker of proximal tubular injury as it is secreted into the urine during the first 12 h of injury. Notably, the high KIM-1 expression is characteristically seen in areas of fibrosis and inflammation. It is, therefore, not surprising that in diabetic nephropathy (DN), whose major pathogenic components include renal fibrosis, mesangial expansion, glomerular hypertrophy, oxidative stress, and tubular inflammation, high levels of this biomarker have been observed. For instance, in a retrospective study of type 1 diabetics with DN (CKD stages 1–3), 63% of the patients with higher plasma KIM-1 levels ended up with ESKD; on the other hand, only 20% of their counterparts with lower plasma KIM-1 levels progressed to develop ESKD. Furthermore, the researchers found that baseline plasma KIM-1 levels correlated with the rate of decline of eGFR after adjusting for baseline urinary albumin-to-creatinine ratio, eGFR, and glycated hemoglobin. The study, thus, shows that KIM-1 is likely a predictor of CKD progression to ESKD, although validation by further studies is still required. Neutrophil gelatinase-associated lipocalin (NGAL) is another tubular biomarker which is expressed by tubular renal epithelial cells after tubulointerstitial injury. The predictive role of this biomarker in CKD has been documented in several reports.,,,,, In one report, the authors documented that urinary NGAL levels were higher in patients with IgA nephropathy when compared with controls, while in other reports, a similar finding in patients with polycystic kidney disease was observed, in whom the authors also noted biomarker levels that significantly correlated with serum creatinine., Some investigators have observed that urinary NGAL levels predicted progression from earlier stages of CKD to the late stage of disease, which was associated with mortality and RRT.,, In summary, these findings suggest that plasma or urinary NGAL levels can predict CKD progression independent of GFR, and are negatively correlated with eGFR. Other tubular biomarkers which have been reported as predictors of early and late stages of CKD include urinary N-acetyl-ß-D glucoseaminidase (NAG), liver-type fatty-acid binding protein (L-FABP), cystatin C, and a-1-microglobulin. Some investigators have shown that baseline urinary levels of NAG independently predicted microalbuminuria and macroalbuminuria in type 1 diabetes mellitus. Other authors have also reported that NAG can be considered as a sensitive tubular biomarker for the detection of early renal damage in type 2 diabetics. In addition, elevated urinary NAG has been shown to precede microalbuminuria in type 1 diabetes mellitus. These findings underscore the ability of this biomarker to predict the onset and progression of CKD in diabetic patients. Urinary NAG excretion has also been considered as a reliable marker of proteinuria-induced tubular damage in the early stage of the histological subtypes of idiopathic glomerulonephritis such as membranous nephropathy, FSGS, and minimal change nephropathy (MCN). For L-FABP, a longitudinal study of newly diagnosed type 1 diabetics noted that baseline urinary levels of the biomarker not only predicted the development of microalbuminuria but also the progression of microalbuminuria to macroalbuminuria. Likewise, in type 2 diabetes mellitus, elevated urinary level of L-FABP plays a role in predicting early CKD, and also serves as an independent predictor of the progression of CKD in type 1 diabetics. Obviously, this tubular biomarker has the advantage of predicting renal damage before albuminuria, especially in type 1 diabetics. Again, serum and urinary cystatin C levels are useful biomarkers for the early prediction of nephropathy in type 2 diabetes mellitus, while the predictive role of the urinary level of this biomarker, for the progression of diabetic kidney disease, has been well documented. Finally, a-1-microglobulin (which usually undergoes glomerular filtration and proximal tubular reabsorption) was found to be elevated in the urine of normoalbuminuric type 2 diabetes mellitus patients, preceding the onset of microalbuminuria and confirming the tubular biomarker as a more sensitive and an earlier urinary biomarker of CKD. In fact, a-1-micro-globulin has been identified as an inexpensive biomarker for the early prediction of DN. Monocyte chemoattractant protein -1 (MCP-1) is a proinflammatory cytokine, identified as both a biomarker of inflammation, as well as a glomerular biomarker. Expression of MCP-1 is up-regulated in renal diseases that present with a continued inflammatory response, such as in DN and lupus nephritis., Some reports indeed indicate that elevated levels of urinary MCP-1 were observed in DN, as well as in active lupus nephritis. Interestingly, another report has highlighted that micro inflammation may be a common risk factor for both DN and atherosclerosis in type 2 diabetes mellitus, as the serum and urinary levels of MCP-1 and interferon gamma-induced protein (IP-10) were found to be positively correlated with albuminuria and intima-media thickness. Retinol binding protein 4 (RBP4) is another potential biomarker of CKD. Plasma RBP4 is filtered at the glomerulus and is followed by complete reabsorption at the proximal tubule. Urine RBP4 is thought to be the most sensitive functional biomarker of the proximal tubule, as confounders of its plasma levels such as vitamin A levels and liver disease rarely influence the urine levels as a biomarker. However, a decline in GFR affects the sensitivity of urine RBP4 because of false positive results associated with the glomerular disease. Although urine RBP4 was noted to be a useful biomarker in diseases associated with proximal tubular dysfunction, some investigators were able to establish the prognostic value of this biomarker in kidney transplantation. It was found that urine RBP4 was elevated in patients with the tubulointerstitial disease, and was a risk factor for long-term allograft loss, independent of the histology of renal biopsy as well as albuminuria. Despite the traditional use of serum creatinine as the biomarker for the screening and diagnosis of kidney disease, its several drawbacks have led to its utility in GFR estimating equations. For instance, equations that combine serum creatinine and cystatin C have been shown to be superior to equations that use either of these markers alone. They are recommended when confirmation of CKD is required. Although albuminuria is one of the strongest risk factors for disease outcomes, the combination of urinary albumin-to-creatinine ratio and serum creatinine and cystatin C not only improves risk stratification but also predicts CKD progression and mortality. Nevertheless, the discovery of several novel biomarkers with improved sensitivity and specificity have raised hopes for earlier prediction of CKD. Many of these biomarkers still require validation before they can be used in clinical practice. The authors would like to acknowledge the invaluable information obtained from the article by Lopez-Giacoman and Madero during the preparation of the manuscript. Meguid El Nahas A, Bello AK. Chronic kidney disease: The global challenge. Lancet 2005;365: 331-40. Harambat J, van Stralen KJ, Kim JJ, Tizard EJ. Epidemiology of chronic kidney disease in children. Pediatr Nephrol 2012;27:363-73. Schoolwerth AC, Engelgau MM, Hostetter TH. A public health action plan is needed for chronic kidney disease. Adv Chronic Kidney Dis 2005;12:418-23. Hogg RJ, Furth S, Lemley KV, et al. National kidney foundation's kidney disease outcomes quality initiative clinical practice guidelines for chronic kidney disease in children and adolescents: Evaluation, classification, and stratification. Pediatrics 2003;111:1416-21. Odetunde OI, Okafor HU, Uwaezuoke SN, Ezeonwu BU, Ukoha OM. Renal replacement therapy in children in the developing world: Challenges and outcome in a tertiary hospital in Southeast Nigeria. Scientific World Journal 2014;2014:903151. Levey AS, Coresh J. Chronic kidney disease. Lancet 2012;379:165-80. Pereira BJ. Optimization of pre-ESRD care: The key to improved dialysis outcomes. Kidney Int 2000;57:351-65. Hsu CY, Ballard S, Batlle D, et al. Cross-disciplinary biomarkers research: Lessons learned by the CKD biomarkers consortium. Clin J Am Soc Nephrol 2015;10:894-902. Lopez-Giacoman S, Madero M. Biomarkers in chronic kidney disease, from kidney function to kidney damage. World J Nephrol 2015;4:57-73. Fivush BA, Jabs K, Neu AM, et al. Chronic renal insufficiency in children and adolescents: The 1996 annual report of NAPRTCS. North American pediatric renal transplant cooperative study. Pediatr Nephrol 1998;12:328-37. Ardissino G, Daccò V, Testa S, et al. Epidemiology of chronic renal failure in children: Data from the ItalKid project. Pediatrics 2003;111:e382-7. Mong Hiep TT, Ismaili K, Collart F, et al. Clinical characteristics and outcomes of children with stage 3-5 chronic kidney disease. Pediatr Nephrol 2010;25:935-40. Deleau J, Andre JL, Briancon S, Musse JP. Chronic renal failure in children: An epidemiological survey in Lorraine (France) 1975-1990. Pediatr Nephrol 1994;8:472-6. Esbjörner E, Berg U, Hansson S. Epidemiology of chronic renal failure in children: A report from Sweden 1986-1994. Swedish pediatric nephrology association. Pediatr Nephrol 1997; 11:438-42. Odetunde OI, Okafor HU, Uwaezuoke SN, Ezeonwu BU, Adiele KD, Ukoha OM. Chronic kidney disease in children as seen in a tertiary hospital in Enugu, South-East, Nigeria. Niger J Clin Pract 2014;17:196-200. Ali SH, Hussien FS, Abd Al-Amer H. Profile of renal diseases in Iraqi children: A single-center report. Saudi J Kidney Dis Transpl 2015;26: 613-8. Becherucci F, Roperto RM, Materassi M, Romagnani P. Chronic kidney disease in children. Clin Kidney J 2016;9:583-91. Warady BA, Chadha V. Chronic kidney disease in children: The global perspective. Pediatr Nephrol 2007;22:1999-2009. Vivante A, Hildebrandt F. Exploring the genetic basis of early-onset chronic kidney disease. Nat Rev Nephrol 2016;12:133-46. Black MJ, Sutherland MR, Gubhaju L, et al. When birth comes early: Effects on nephrogenesis. Nephrology (Carlton) 2013;18:180-2. Becherucci F, Lazzeri E, Lasagni L, Romagnani P. Renal progenitors and childhood: From development to disorders. Pediatr Nephrol 2014; 29:711-9. Ding W, Cheung WW, Mak RH. Impact of obesity on kidney function and blood pressure in children. World J Nephrol 2015;4:223-9. Tullus K. Is there an obesity-related epidemic of CKD starting already in childhood? Nephrol Dial Transplant 2013;28 Suppl 4:iv114-6. Uwaezuoke SN. The role of novel biomarkers in childhood idiopathic nephrotic syndrome: A narrative review of published evidence. Int J Nephrol Renovasc Dis 2017;10:123-8. Bai Y, Liu W, Guo Q, Zou Y. Screening for urinary biomarkers of steroid-resistant nephrotic syndrome in children. Exp Ther Med 2013 ;5 : 860-4. Bennett MR, Pordal A, Haffner C, et al. Urinary Vitamin D-binding protein as a biomarker of steroid-resistant nephrotic syndrome. Biomark Insights 2016;11:1-6. Leroy S, Fernandez-Lopez A, Nikfar R, et al. Association of procalcitonin with acute pyelonephritis and renal scars in pediatric UTI. Pediatrics 2013;131:870-9. Chevalier RL. Biomarkers of congenital obstructtive nephropathy: Past, present and future. J Urol 2004;172:852-7. Trnka P, Ivanova L, Hiatt MJ, Matsell DG. Urinary biomarkers in obstructive nephropathy. Clin J Am Soc Nephrol 2012;7:1567-75. Uwaezuoke SN. 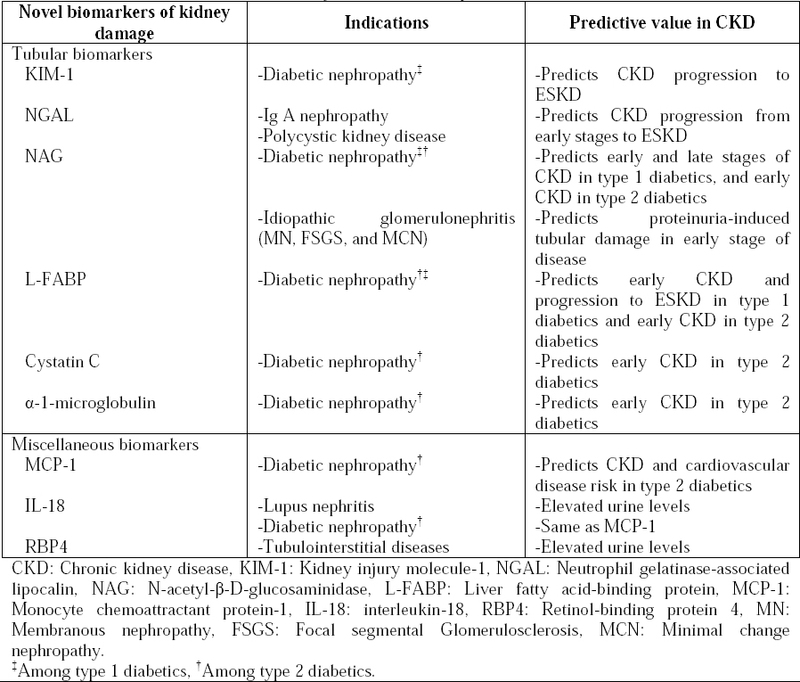 The role of novel biomarkers in predicting diabetic nephropathy: A review. Int J Nephrol Renovasc Dis 2017;10:221-31. Lamb EJ, Levey AS, Stevens PE. The kidney disease improving global outcomes (KDIGO) guideline update for chronic kidney disease: Evolution not revolution. Clin Chem 2013;59: 462-5. Levey AS, Inker LA, Coresh J. GFR estimation: From physiology to public health. Am J Kidney Dis 2014;63:820-34. Traynor J, Mactier R, Geddes CC, Fox JG. How to measure renal function in clinical practice. BMJ 2006;333:733-7. Branten AJ, Vervoort G, Wetzels JF. Serum creatinine is a poor marker of GFR in nephrotic syndrome. Nephrol Dial Transplant 2005;20: 707-11. Preiss DJ, Godber IM, Lamb EJ, Dalton RN, Gunn IR. The influence of a cooked-meat meal on estimated glomerular filtration rate. Ann Clin Biochem 2007;44:35-42. Earley A, Miskulin D, Lamb EJ, Levey AS, Uhlig K. Estimating equations for glomerular filtration rate in the era of creatinine standardization: A systematic review. Ann Intern Med 2012;156:785-95, W-270, W-271, W-272, W-273, W-274, W-275, W-276, W-277, W-278. Madero M, Sarnak MJ. Association of cystatin C with adverse outcomes. Curr Opin Nephrol Hypertens 2009;18:258-63. Shlipak MG, Matsushita K, Ärnlöv J, et al. Cystatin C versus creatinine in determining risk based on kidney function. N Engl J Med 2013; 369:932-43. Levey AS, Coresh J, Greene T, et al. Expressing the modification of diet in renal disease study equation for estimating glomerular filtration rate with standardized serum creatinine values. Clin Chem 2007;53:766-72. Inker LA, Schmid CH, Tighiouart H, et al. Estimating glomerular filtration rate from serum creatinine and cystatin C. N Engl J Med 2012; 367:20-9. Horio M, Imai E, Yasuda Y, Watanabe T, Matsuo S; Collaborators Developing the Japanese Equation for Estimated GFR. GFR estimation using standardized serum cystatin C in Japan. Am J Kidney Dis 2013;61:197-203. Zhu Y, Ye X, Zhu B, et al. Comparisons between the 2012 new CKD-EPI (Chronic kidney disease epidemiology collaboration) equations and other four approved equations. PLoS One 2014;9:e84688. Guo X, Qin Y, Zheng K, et al. Improved glomerular filtration rate estimation using new equations combined with standardized cystatin C and creatinine in Chinese adult chronic kidney disease patients. Clin Biochem 2014;47: 1220-6. Ninomiya T, Perkovic V, de Galan BE, et al. Albuminuria and kidney function independently predict cardiovascular and renal outcomes in diabetes. J Am Soc Nephrol 2009;20:1813-21. Ruggenenti P, Remuzzi G. Time to abandon microalbuminuria? Kidney Int 2006;70:1214-22. Matheson A, Willcox MD, Flanagan J, Walsh BJ. Urinary biomarkers involved in type 2 diabetes: A review. Diabetes Metab Res Rev 2010;26:150-71. Hallan SI, Ritz E, Lydersen S, et al. Combining GFR and albuminuria to classify CKD improves prediction of ESRD. J Am Soc Nephrol 2009;20:1069-77. Warnock DG, Muntner P, McCullough PA, et al. Kidney function, albuminuria, and all-cause mortality in the REGARDS (Reasons for geographic and racial differences in stroke) study. Am J Kidney Dis 2010;56:861-71. Han WK, Bailly V, Abichandani R, Thadhani R, Bonventre JV. Kidney injury molecule-1 (KIM-1): A novel biomarker for human renal proximal tubule injury. Kidney Int 2002;62:237-44. Krolewski AS, Niewczas MA, Skupien J, et al. Early progressive renal decline precedes the onset of microalbuminuria and its progression to macroalbuminuria. Diabetes Care 2014;37:226-34. Mishra J, Mori K, Ma Q, et al. Neutrophil gelatinase-associated lipocalin: A novel early urinary biomarker for cisplatin nephrotoxicity. Am J Nephrol 2004;24:307-15. Ding H, He Y, Li K, et al. Urinary neutrophil gelatinase-associated lipocalin (NGAL) is an early biomarker for renal tubulointerstitial injury in IgA nephropathy. Clin Immunol 2007;123:227-34. Bolignano D, Coppolino G, Campo S, et al. Urinary neutrophil gelatinase-associated lipocalin (NGAL) is associated with severity of renal disease in proteinuric patients. Nephrol Dial Transplant 2008;23:414-6. Bolignano D, Coppolino G, Campo S, et al. Neutrophil gelatinase-associated lipocalin in patients with autosomal-dominant polycystic kidney disease. Am J Nephrol 2007;27:373-8. Bhavsar NA, Köttgen A, Coresh J, Astor BC. Neutrophil gelatinase-associated lipocalin (NGAL) and kidney injury molecule 1 (KIM-1) as predictors of incident CKD stage 3: The atherosclerosis risk in communities (ARIC) study. Am J Kidney Dis 2012;60:233-40. Smith ER, Lee D, Cai MM, et al. Urinary neutrophil gelatinase-associated lipocalin may aid prediction of renal decline in patients with non-proteinuric stages 3 and 4 chronic kidney disease (CKD). Nephrol Dial Transplant 2013; 28:1569-79. Bolignano D, Lacquaniti A, Coppolino G, et al. Neutrophil gelatinase-associated lipocalin (NGAL) and progression of chronic kidney disease. Clin J Am Soc Nephrol 2009;4:337-44. Kern EF, Erhard P, Sun W, Genuth S, Weiss MF. Early urinary markers of diabetic kidney disease: A nested case-control study from the diabetes control and complications trial (DCCT). Am J Kidney Dis 2010;55:824-34. Nielsen SE, Sugaya T, Hovind P, Baba T, Parving HH, Rossing P. Urinary liver-type fatty acid-binding protein predicts progression to nephropathy in type 1 diabetic patients. Diabetes Care 2010;33:1320-4. Jeon YK, Kim MR, Huh JE, et al. Cystatin C as an early biomarker of nephropathy in patients with type 2 diabetes. J Korean Med Sci 2011; 26:258-63. Shore N, Khurshid R, Saleem M. Alpha-1 microglobulin: A marker for early detection of tubular disorders in diabetic nephropathy. J Ayub Med Coll Abbottabad 2010;22:53-5. Patel DN, Kalia K. Efficacy of urinary N- acetyl-ß-D glucosaminidase to evaluate early renal tubular damage as a consequence of type 2 diabetes mellitus: a cross-sectional study. Int J Diabetes Dev Ctries 2015;35 Suppl 3:449-57. Jones AP, Lock S, Griffiths KD. Urinary N- acetyl-ß-glucosaminidase activity in type 1 diabetes mellitus. Ann Clin Biochem 2006;21: 142-8. Bazzi C, Petrini C, Rizza V, et al. Urinary N- acetyl-beta-glucosaminidase excretion is a marker of tubular cell dysfunction and a predictor of outcome in primary glomerulonephritis. Nephrol Dial Transplant 2002;17: 1890-6. Kamijo-Ikemori A, Sugaya T, Yasuda T, et al. Clinical significance of urinary liver-type fatty acid-binding protein in diabetic nephropathy of type 2 diabetic patients. Diabetes Care 2011 ;34: 691-6. Panduru NM, Forsblom C, Saraheimo M, et al. Urinary liver-type fatty acid-binding protein and progression of diabetic nephropathy in type 1 diabetes. Diabetes Care 2013;36:2077-83. Kim SS, Song SH, Kim IJ, et al. Urinary cystatin C and tubular proteinuria predict progression of diabetic nephropathy. Diabetes Care 2013;36:656-61. Hong CY, Hughes K, Chia KS, Ng V, Ling SL. Urinary alpha1-microglobulin as a marker of nephropathy in type 2 diabetic Asian subjects in Singapore. Diabetes Care 2003;26:338-42. Wada T, Furuichi K, Sakai N, et al. Up-regulation of monocyte chemoattractant protein- 1 in tubulointerstitial lesions of human diabetic nephropathy. Kidney Int 2000;58:1492-9. Wada T, Yokoyama H, Su SB, et al. Monitoring urinary levels of monocyte chemotactic and activating factor reflects disease activity of lupus nephritis. Kidney Int 1996;49:761-7. Takebayashi K, Matsumoto S, Aso Y, Inukai T. Aldosterone blockade attenuates urinary monocyte chemoattractant protein-1 and oxidative stress in patients with type 2 diabetes complicated by diabetic nephropathy. J Clin Endocrinol Metab 2006;91:2214-7. Noris M, Bernasconi S, Casiraghi F, et al. Monocyte chemoattractant protein-1 is excreted in excessive amounts in the urine of patients with lupus nephritis. Lab Invest 1995;73:804-9. Kajitani N, Shikata K, Nakamura A, Nakatou T, Hiramatsu M, Makino H. Microinflammation is a common risk factor for progression of nephropathy and atherosclerosis in Japanese patients with type 2 diabetes. Diabetes Res Clin Pract 2010;88:171-6. Nakamura A, Shikata K, Hiramatsu M, et al. Serum interleukin-18 levels are associated with nephropathy and atherosclerosis in Japanese patients with type 2 diabetes. Diabetes Care 2005;28:2890-5. Bernard AM, Vyskocil AA, Mahieu P, Lauwerys RR. Assessment of urinary retinol-binding protein as an index of proximal tubular injury. Clin Chem 1987;33:775-9. Bernard A, Vyskocyl A, Mahieu P, Lauwerys R. Effect of renal insufficiency on the concentration of free retinol-binding protein in urine and serum. Clin Chim Acta 1988;171:85- 93. Norden AG, Scheinman SJ, Deschodt-Lanckman MM, et al. Tubular proteinuria defined by a study of dent's (CLCN5 mutation) and other tubular diseases. Kidney Int 2000;57:240-9. Amer H, Lieske JC, Rule AD, et al. Urine high and low molecular weight proteins one-year post-kidney transplant: Relationship to histology and graft survival. Am J Transplant 2013; 13:676-84.